Another child dies from a curtain cord. A warning to all parents. A tragic loss of life, weeks before Christmas, that could have been avoided. It is a tragedy we have heard time and time again. This time a 10-year old boy has lost his life. It may be across the other side of the world but it is a very real danger facing our children, here in Australia too. The 10-year old boy died after becoming entangled in a curtain cord at his family’s home on the Isle of Wight on the weekend. News reports show that he was given CPR and taken hospital, but that he was unable to be saved. His 32-year old mother was reportedly “too distraught to talk”. The boy who is said to have had special needs was said to be the type of child who was always smiling, always happy. Detectives from Hampshire Constabulary were investigating the incident but a police spokesman said that they were not treating the death as suspicious. A tragic, awful loss of life, just weeks before Christmas, and one that could have been avoided. In the last year in Australia, three children have died after becoming entangled in curtain, or blind cords, two of the incidents happened within one week. In February, 15-month-old Eden was found choking on a blind cord in her Quakers Hill home in NSW. Her mother told police that she went to check on her daughter after she had not woken from what she thought was an unusually long afternoon nap. What she found was her baby girl dying. Paramedics tried to resuscitate the little girl but she died in hospital. It came only a week after a 16-month-old girl, Tabitha Slade, also from NSW, was found unconscious in her cot with a cord wrapped tightly around her neck. Little Tabitha died too in hospital only an hour later. The stories of these children’s deaths are painful to read, but important. One UK family who is calling for blinds to be made cord-free released an image of their daughter, Sophie Allen, who they lost in June. It is difficult to imagine the pain these families are feeling facing Christmas without their precious children. Kid Safe executive officer Christine Erksine has said that parents were not always aware of the dangers posed by blind cords. "It’s just one of those horrible accidents that can happen,’’ Ms Erskine told Fairfax Media earlier this year. "One of the issues is in smaller rooms, there’s not much choice about where to put furniture, so you may put the cot against the window for light and space." In Australia at least 11 children died between 2001 and 2008 after being caught in blind cords according to the Australian Competition and Consumer Commission. 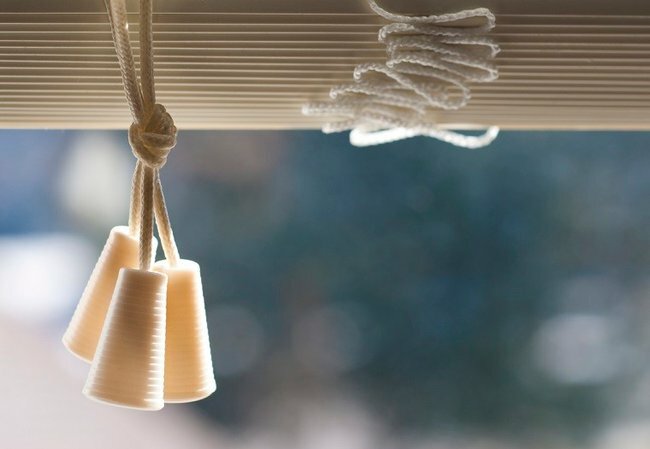 In the US a child between seven months and 10 years dies every month after being strangled by cord or curtain blinds. In order to stop the tragedy being repeated the ACCC has an information sheet for parents on blind cord safety. In the meantime the best we can do is spread the word, talk about these tragedies to raise awareness and hope that through this future deaths are prevented. Please leave your words of comfort for the mum below in the comments. To access the ACCC safety information click here. Make sure this heartbreaking accident doesn’t happen to you or your friends.